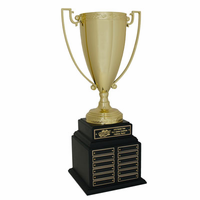 Scroll down for great selection of Cup Trophies in a variety of styles. 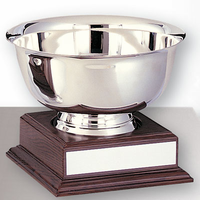 Each cup and bowl trophy includes free engraving! Each cup trophy includes free personalization! Metal Trophy CupsStylish metal cup - available in 3 sizes. Fast 1-2 day shipping! Silver cup awards for special recognition. Choice of over 50 figures! Great for fantasy leagues! A fabulous selection of unique cup and bowl awards. 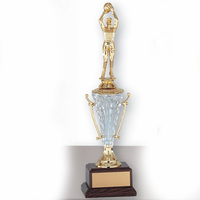 Large Perpetual Trophy with Cup and 12 NameplatesFree Personalization! 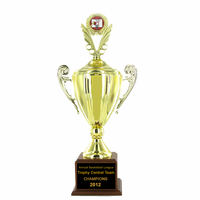 TrophyCentral carries a fabulous selection of cup trophies in a variety of styles. For example, you can choose your size (small or large), finish (gold or silver), material (plastic or metal), and style (participation, column or perpetual). If you are looking for a truly special Championship Trophy, be sure to see our Wine Cooler Cup. Sometimes you need to recognize more than one winner. Our perpetual cup awards are just what you need. Each perpetual trophy has room for multiple winners. Some even have room for 32 names, so they can be used for years to come!